The mayor of Tirana, Erion Veliaj, shook hands today with the inhabitants of the Astir area, by channeling the issue of enlargement of the Great Ring on the way of the solution. He hosted today in a meeting in the hall of the Municipal Council an expanded representation of residents of Astir, who are affected by the project of the Great Ring. Veliaj thanked the residents who agreed to pave the way for the implementation of the project, which will also turn this segment of the Ring into a road according to all standards, helping at the same time the car traffic. "This city is determined to get developed and must move forward. The reason why I want to thank all the other friends is that at least here we have no partition, here we have the maximum agreement that this city will develop, walk ahead, build avenue, schools, kindergartens, parks etc, and often for these jobs are needed some of the construction steps, and this is clear. 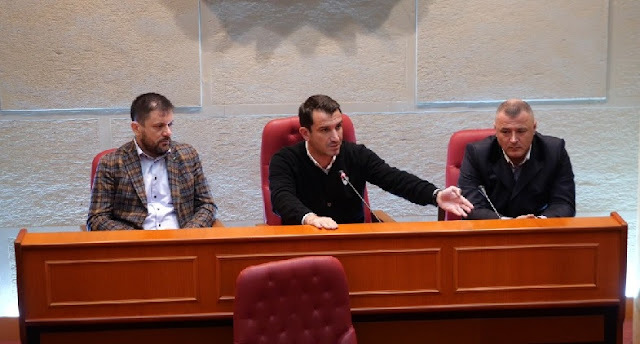 The fact that we have stabilized this basis of agreement is a good start," said the head of the Municipality of Tirana, Erion Veliaj during the conversation he had with them. He stressed that from the projects that bring development to the city nobody loses. "Here no one wants to be lost and I believe that there is all the understanding, kindness that nobody loses. When I speak I do not miss anyone I want to share these categories. Who has problems , who is without money, who is without legalization, like the case of two families moving last night; I saw the first family, I will go to meet again, they build a house with the conditions, with a very difficult life in the channel of sewage. Inside the house that is demolished last night, in the first two, was the wastewater tank. They put the carpet above, the table above the carpet and lived on the sewage cover. Today, they are in social housing, but it is better to break it without collector's permission and today they have a home they can keep indefinitely," said Veliaj. Veliaj announced once again that for all those who have no economic opportunity, the Municipality of Tirana has made available some solutions from its social package, ranging from the rental bonus to the social housing. "The cash lease bonus is 3 years, and we can increase it, but it is a social housing all your life. It means that we were prepared for all these categories as the two houses demolished last night, like the two houses that are destroyed this morning, like the two houses that are going to be demolished now, which enter in the category that they did not even made the legalization papers , they had not even a certificate of ownership, they had not even where to put their heads, today they put their head in a much better place, with social workers, social cafes, restaurants, with all the services offered in that area," added the mayor. One of the reasons the Mayor thanked the residents who agreed to cooperate is that they have distanced themselves from the policy that seeks to use this protest for political gains. "There is another category that is a category that I say can not help, which is the category of politicians. The category of those who want to run on the upcoming lists, the category of those who are not resident there but who come by buses for them. They are a category that I can not help, they need social help, counseling, they need love from society, but these are not residents, and come here for "sport", as they they came to the theater. Who comes from a deputy who until yesterday was in London...this is a category that does not comes for your problems.